In this completely updated new edition, the best-selling author of 101 Great Answers to the Toughest Interview Questions and 101 Smart Questions to Ask on Your Interview takes you step-by-step through the hiring process. Whether you're replacing an employee who's leaving or creating a new position in your organization, Ron Fry shows you how to write a concise and accurate job description, identify key competencies, and how to translate them into a realistic set of search criteria. Ask the Right Questions, Hire the Best People also shows you: *How to attract the best applicants. *What to look for when you re screening resumes, in your office or online. *What questions you should ask in the interview...and when to ask them. *How to listen more effectively to what the applicant is really telling you. *How to probe for information the applicant doesn't want to reveal. *What questions the law permits and forbids. 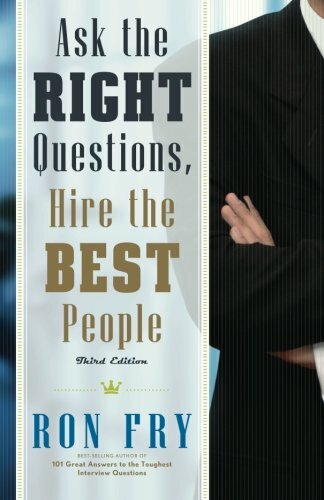 Whether you re an interviewing novice or a seasoned pro, you ll find all the answers you need in Ask the Right Questions, Hire the Best People!